I had a soft, painless, swelling on my right thumb for many years… on the outer surface and centrally located just above the joint. My Jin Shin Jyutsu practitioner thought it may have been a reaction to chronic overuse. It may also have been a reaction to habitual tension that I hold in my fingers when I’m concentrating on a project. My family on my father’s side is also prone to developing osteoarthritic finger joints as we age. 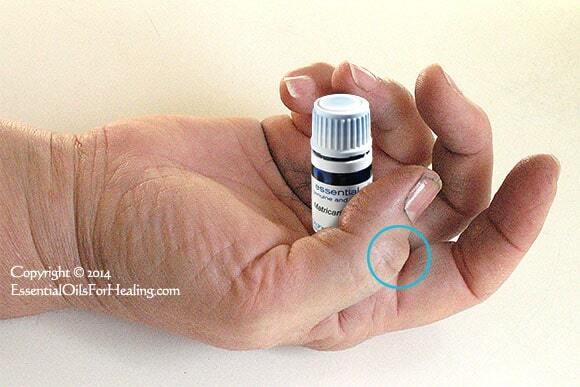 (See our article QUICK Relief for Sore, Inflamed Joints: Arthritis, Rheumatism, Injuries, etc.) It’s possible that what my family members suffer from, and I may have been exhibiting early stages of, were Heberden’s nodes. 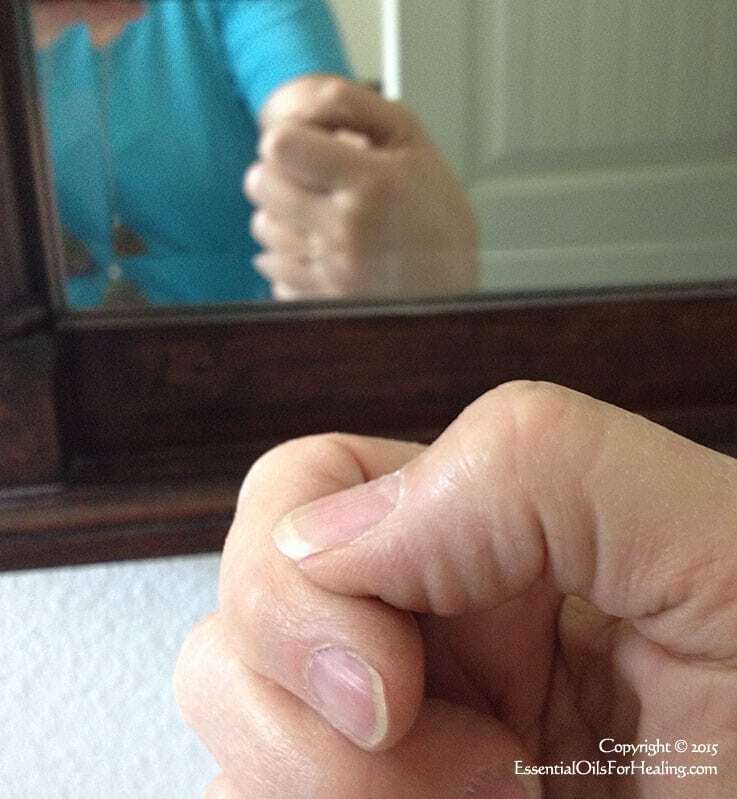 “Heberden’s nodes are hard or bony swellings that can develop in the distal interphalangeal joints (DIP) (the joints closest to the end of the fingers and toes). They are a sign of osteoarthritis and are caused by formation of osteophytes (calcific spurs) of the articular (joint) cartilage in response to repeated trauma at the joint. I had tried stimulating the joint with finger massage to reduce the swelling, which had some temporary effect, but didn’t clear it up. So, four years ago began an off-and-on experiment using essential oils with strongly anti-inflammatory properties to see if I could help my thumb joint heal. 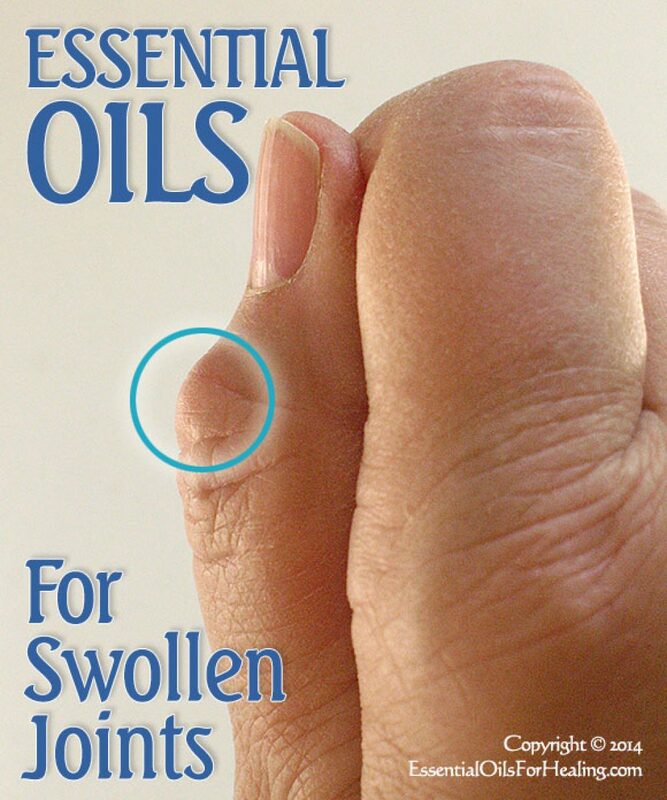 The analgesic (pain-relieving) and anti-inflammatory essential oils I had used in early 2010 to relieve a sudden, VERY painful, stiffening joint flare-up of my middle finger (see other article) were GERMAN CHAMOMILE and LAVENDER. Then in the spring of 2011 (shortly after the Fukushima nuclear disaster*), a VERY itchy, sometimes painful, chronic skin irritation developed on my right groin. At times, it was so awful the skin would weep a clear fluid! I had to wear a soft gauze pad for fluid absorption to prevent staining my clothing. *COMMENT: We were living in California about a half hour’s drive from the Pacific coast. Much of the western coast of the USA received an intensive dose of radioactive fallout immediately after the initial meltdown that was being tracked by radioactive fallout monitors across the United States and Europe, since then all have been taken off-line. (Makes one wonder why?) Now, more than four years later the Pacific ocean and the northern hemisphere has been and continues to be polluted with high levels of radioactive fallout. Of course, there has been no ‘official’ governmental or health announcement – warning – alert or conventional media coverage on how this on-going disaster is impacting the environment and all of our health. Suspected it was a rash from a topical candida infection caused by strain on my immune system from the radioactive spike in California’s atmosphere and precipitation (coastal fog, dew, rain, etc.). At a routine health exam, the nurses agreed it was most likely an aggressive candida flare-up. Naturally, I turned to my reliable, gentle, essential oils to manage – and hopefully, heal – my groin infection…a much more acute and concerning issue than the swelling on my thumb. Over the past four plus years, I’ve used a variety of naturally healing oils on the candida skin infection. In addition to GERMAN CHAMOMILE and LAVENDER, I used alternate applications of virgin COCONUT OIL for its immune system support and tissue repair, plus gentle anti-fungal, anti-inflammatory, healing properties, along with two essential oil blends: TRINITY and RC. In mid-April 2015 we left California to relocate in central Arizona’s highlands. In the 3-1/2 months of living here, my skin rash has almost entirely healed only flaring up mildly, when the weather is hot and I get sweaty. I’ve also noticed from all those years of using anti-inflammatory oils almost daily, my thumb joint has healed and the swelling is completely gone! After four years of using anti-inflammatory essential oils and virgin coconut oil, my chronically swollen thumb joint has healed. I would like to try this. How often do you apply German Chamomile and Lavender to swollen joints? I can use coconut oil as a carrier. Susan ~ You can use a quality brand of German Chamomile and Lavender essential oils w/o diluting them, anytime your joints are painful. If they’re just stiff and inflamed, a dilution may be better for long term use. Suggest applying at least morning and evening. More often, if you’re uncomfortable. As I wrote in the article, I was using the oils almost daily for several years.